This is a pair of XC-PRO Cross Country high performance sintered metal disc brake pads from DP Brakes. DP Brakes is a world leading manufacturer of sintered motorcycle brake pads and has now introduced their technology to an exciting range of brake pads and rotors for the off road cycle community. DP Brakes has been the first choice for MX, Enduro and Off Road competitors for years and has won more off road titles than any other brake pad manufacturer in the world. For 30 years DP Brakes has been the industry leader in developing brake pad compounds and we guarantee you will find improved performance over your current pad or your money back. 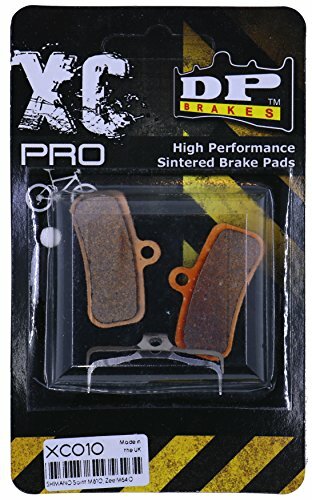 XC-PRO Cross Country high performance sintered metal disc brake pads from DP Brakes produce the best all-round performance for XC and trail-riding. Hot or cold, wet or dry, the sintered metal compound offers consistent high-friction braking you can depend on. Developed for the cross country rider, this new sintered brake pad offers the ideal combination of high performance and durability. Based on our DP Brake's MX-PRO Moto-X and Enduro motorcycle brake pads, the XC-PRO provides excellent brake feedback in all weather conditions. The XC-PRO pad will outlast competitor pads particularly when used in wet, muddy and sandy terrain. DETAILS: - Sintered metal replacement disc brake pads. - Engineered to offer superb braking power and feel while still providing long service life. - Superior braking even in the most adverse weather conditions. - Virtually no difference between dry and wet braking performance. - Ultra resistant to contamination from brake fluid. - Ideal for XC and trail riders wanting excellent performance and long life. COMPATIBLE WITH: SHIMANO Saint M810, Zee M640 GENERAL INFORMATION: Always check your brakes are working correctly before every ride. New disc brake pads require bedding-in to the rotor before full power is achieved. Engineered to offer superb braking power and feel while still providing long service life. Ideal for xc and trail riders wanting excellent performance and long life. Ultra resistant to contamination from brake fluid. If you have any questions about this product by DP Brakes, contact us by completing and submitting the form below. If you are looking for a specif part number, please include it with your message.